Mount Harmon Plantation originated as a land grant of 350 acres to Godfrey Harmon by Caecilius Calvert, the second Lord Baltimore, in 1651. During the seventeenth and eighteenth centuries, Mount Harmon prospered as a tobacco plantation. As you drive down the two-mile lane, through the tunnel formed by Osage orange trees, you will appreciate the isolation of those times, when transportation moved most freely by water. Three of the owners during the period had their own schooners to transport tobacco to the British Isles and return with furnishings and necessities for the house and farm. James Louttit, a Scotsman who bought Mount Harmon in 1760, called his schooner the “Bee”. He, his Irish wife Mary George, and their descendants lived in Mount Harmon from 1760 to 1810. Their families’ coats of arms are displayed on the gate posts. Subsequently, the plantation passed into another branch of the family. In 1817, Mount Harmon became the property of Sidney George Fisher. He is known today for his copious diaries in which he describes society, plantation life and agriculture in the nineteenth century. Click here to read excerpts from Fisher’s diaries. In 1927, at the death of his son, a historian who spelled his name Sydney George Fisher, Mount Harmon passed out of the family. In 1963, Mrs. Harry Clark Boden, IV fulfilled a lifelong dream when she bought Mount Harmon. She hired Albert Kruse, AIA, restoration architect of the Court House in New Castle, Delaware, to restore the manor house to the period of 1760 – 1810 when her direct ancestors of the Louttit and George families lived there. Mount Harmon has been in the public domain since 1974 when Mrs. Boden donated it to a national preservation organization so that it would be maintained and opened to the public into the future. Thanks to these preservation efforts, Mount Harmon stands today as one of the region’s finest examples of an 18th century Tidewater plantation. Mrs. Boden’s married name was Marguerite du Pont de Villiers Boden, and her restoration recreated Mount Harmon to the time when her ancestors lived there during in the golden age of tobacco. 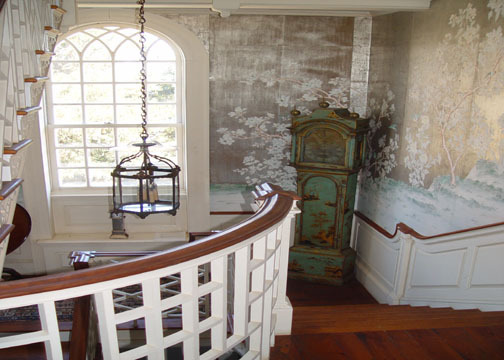 Mrs. Boden’s restoration was a conjectural recreation of gentry manor houses of the Tidewater region, and has a chippendale staircase railing like one at nearby “Bohemia”. No expense was spared in the restoration, with beautifully furnished period rooms that reflect Loutit and George family inventories. Mount Harmon stands today as an important example both of a Tidewater Plantation and of the du Pont family’s legacy in historic preservation. In 1997, Friends of Mount Harmon, Inc. became the owners of Mount Harmon. Their mission is to preserve and interpret the plantation for the education and enjoyment of visitors. Preservation at Mount Harmon has created a lasting legacy of historic stewardship and education. Visitors to Mount Harmon learn about the lifestyle, culture, agriculture and trade of a Tidewater plantation and enjoy the pristine natural surroundings, little changed by time. During the colonial era, Mount Harmon was a bustling tobacco plantation and center of trade, with a diverse and complex community of people living on site including the gentry owners, as well as indentured servants, slaves, and tenant farmers. The laborers: enslaved, indentured and tenant famers, created wealth and prosperity for Mount Harmon’s owners. Friends of Mount Harmon are currently working to further research the plantation’s slave history and have started an exciting new project entitled “Altered Journeys” which will develop and interpret Mount Harmon’s slave and indentured servants’ history. Friends of Mount Harmon, Inc. continue to work to preserve Mount Harmon, and to raise funds for ongoing restoration and preservation projects. Like all historic buildings that have seen more than 250 years of weather and activity, the plantation’s restoration needs are ongoing. FOMH has embarked on a Capital & Preservation Campaign to raise $250,000 to fund the plantation’s restoration and capital improvement needs. You can help to preserve Mount Harmon by contributing to Mount Harmon’s capital campaign. Of the $250,000 Capital Campaign goal, just over $175,000 has been raised to date. Thanks to grants and contributions from supporters like you, Friends of Mount Harmon, Inc. has been able to restore the exterior of the Manor House and the Colonial Kitchen, and convert the outdated pool into the new special event site at the plantation. Grant funding has made it possible to renovate the stables into our new Education & Discovery Center, which features a Mount Harmon Highlights in History Exhibit, expanded educational programming, and upgraded public facilities. Grant funding has also made it possible to recreate several of Mount Harmon’s colonial era outbuildings including the smoke house and tobacco barn. The reconstruction of plantation slave quarters is in the works and will help better educate visitors about Mount Harmon’s slave history. FOMH is actively seeking additional funding to continue to preserve Mount Harmon, research the FOMH archives, make lane improvements, and build our operational capacity. Every donation makes a difference and helps to preserve Mount Harmon for you, your friends and family, and for future generations. There is still time for you to help. Please contribute today and help to preserve this important historic and pristine natural site – every donation makes a difference and helps to preserve Mount Harmon for you, your friends and family, and for future generations. Contributions are tax deductible.